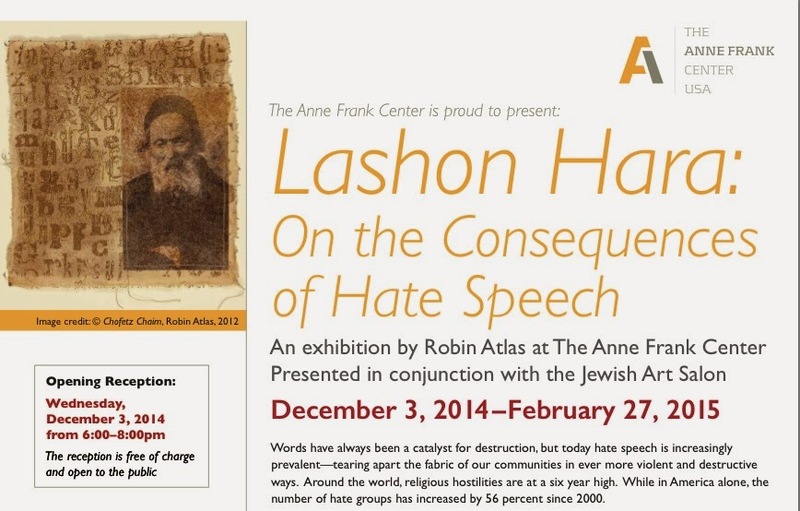 An exhibition by Robin Atlas at The Anne Frank Center USA. Presented in conjunction with the Jewish Art Salon. Exhibit on view: December 3, 2014 - February 27, 2015, Tue-Sat 10-5. The exhibit will be accompanied by a series of workshops, discussions and artist lectures on relevant themes. A basic tenet of Judaism: Those who speak evil about others are punished by midah k’neged midah or measure for measure. We reap measure for measure in the world to come. 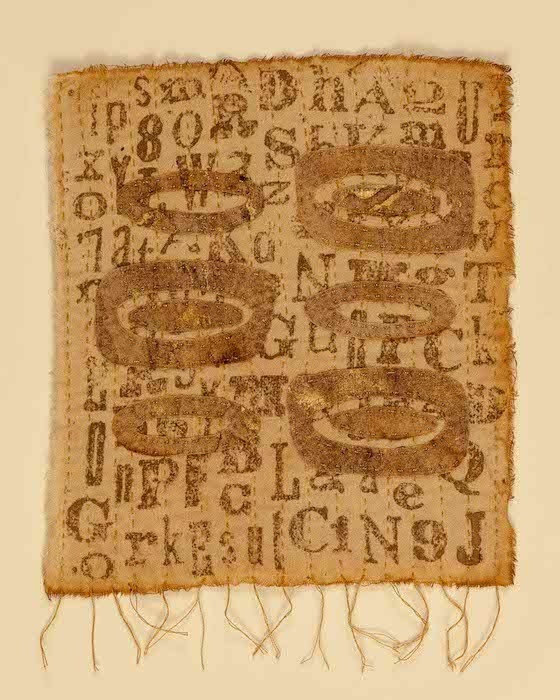 As part of her exhibit, Lashon Hara: On the Consequences of Hate Speech, textile artist Robin Atlas will offer a cut-up poetry workshop for young people using existing text and collage techniques to create and “grown” new poems. 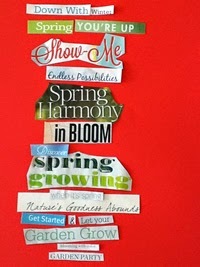 Poetry, paper and glue will be provided. Suggested age: 8 and up. Trains: F to East Broadway - Exit at Rutgers Street. B or D to Grand Street.Buses: M15 to Grand and Allen Streets. M15 Select to Hester and Allen Streets. A Pillow Full of Feathers. In a small town somewhere in Eastern Europe lived a man who talked too much about other people. Whenever he heard a story or rumor about somebody he felt compelled to repeat it. He loved the attention he got because of the way he told his anecdotes, sometimes embellishing them with little details he invented to make them even funnier or juicier. One day he heard a rumor about another businessman in town. He told his colleagues, who told it to their friends, who told it to their wives, who told it to their friends, who told it to their neighbors and so on; going around the town, until the businessman who was the target of the rumor finally heard it. He went to the Rabbi of the town and told the Rabbi of the rumor going around which had tarnished his good name and reputation. Later that day the Rabbi summoned the man who talked too much about other people to his study. The Rabbi figured that if he was not the one who initiated the rumor, then he might at least know who did. “I feel terrible about this,” the man who talked too much about other people stated. “What can I do to undo this? I will do anything.” The Rabbi asked him: “Do you have any feather pillows in your house?” “Rabbi, you know that I am not a poor man; I have many feather pillows at home. What do you want me to do, sell them?” “No, just bring me one,” said the Rabbi. The man was mystified, but he returned to the Rabbi’s study with a nice fluffy pillow under his arm. The Rabbi opened a window in his study and handed the man a knife. “Please cut your pillow open.” The man looked at him quizzically and said, “Rabbi, here in your study? It will make a mess!” “Please, cut it open” the Rabbi said again. 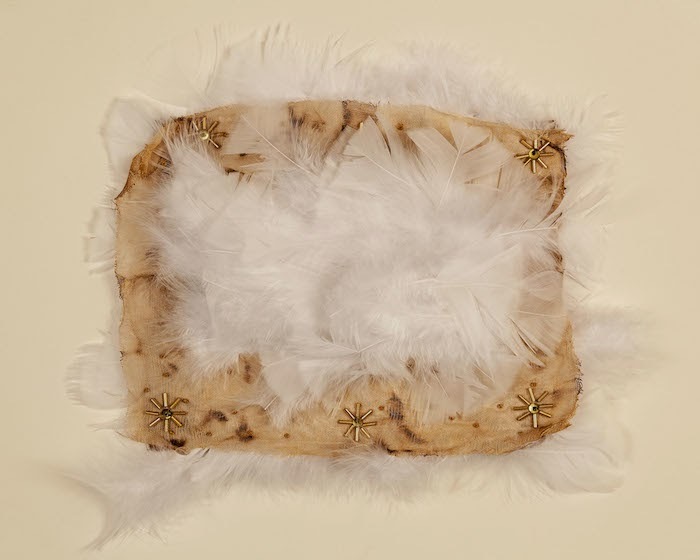 The man did as he was told and cut open the pillow and a torrent of feathers came pouring out. They landed on the desk and on the chairs and on the bookcase, and on the clock, and on the cat which jumped after them. They floated over the table and into the teacups, on the Rabbi and on the man with the knife, and a lot of them swirled out of the window and were carried away by the breeze. Hi, I could work with you? I'm unable to attend any of the Lashon Hara events as I live in California, but am hoping there will ultimately be a website where I can view pictures of the entire exhibit, as well as get a taste of some of what took place during the discussions and workshops.